The green, black and white Monster Energy Drink paint scheme has covered every car that Ken Block has competed in all of the way back to his Subaru rally days but starting in 2013, Ken Block’s Ford Fiesta race cars will have a new paint scheme while also departing from the Monster World Rally team name – and dropping a subtle hint about the upcoming Gymkhana 6 video. In the world of motorsports, there are few drivers who are better known for the look of their race cars than Mr. Ken Block. Ken’s black, white and green Monster Energy Drink Ford Fiesta and Focus rally cars are recognized all over the world – which has in turn created a hugely popular lineup of apparel that sports those same colors. However, the millions of Ken Block fans around the world will soon have a great deal more blue in their wardrobe as Block’s 2013 Monster and DC Shoes Ford Fiesta rally cars have foregone a great deal of the lime green in exchange for a new bright blue as well as some purple, orange and red. Shown in the large image on the right is Ken Block’s 2013 Ford Fiesta Rally Car that will compete in the quickly growing Global RallyCross Series sporting the great looking new paint scheme with a ton more color than the previous design. Our gallery offers a look at both Ken Block’s Hybrid Function Hoonage Vehicle (HFHV) along with his GYM3 car and you can check those out by clicking any of the thumbnails on the right. In addition to the new blue paint scheme, Ken Block has renamed his race team the Hoonigan Racing Division – doing away with the Monster World Rally Team name under which Ken has competed for years. This new scheme and new team name comes with a new team headquarters in Park City Utah and – of course – a new team logo which will be featured on plenty of hats and t-shirts. The Hoonigan Racing Division headquarters offers some 12,000 square feet of both garage and office space fitted with everything that a proper rally car team needs – ranging from a deluxe racing video game area, a kitchen equipped with countertops made from recycled skate board decks and a stationary ping pong table. Oh, there is also a massive garage area where the team can build and repair some of the most recognizable cars in modern motorsports. You can check out pictures of the new team HQ on Ken Block’s Facebook page by clicking here (it will open in a new tab or window). As you can see in the images on the right, the Monster Energy Drink brand is still a prominent sponsor of Ken Block’s race ready Ford Fiesta hatchbacks along with DC Shoes, Ford, GoPro, Pirelli tires, Shining Monkey detailing supplies and a variety of others. The Monster green that has become so closely associated with Ken Block still appears on the large Monster logos on all sides of the car with the Monster logos spread along the rear quarter panels. However, where the previous #43 Block Fiestas had bright green trim on the wheels, the hood and the massive rear spoiler - the 2013 Hoonigan Racing Division cars now wear the new bright blue. Also, where a large portion of Ken Block’s cars in the past have been white, there is almost no white on the new cars with more blacks and grays while the entire car is splashed in blues, purples, oranges and reds. While some of the long time Ken Block fans might be shocked to see him depart from his familiar race livery – there is no question that the new scheme looks awesome. Ken’s decision to go this direction with the new paint scheme was inspired by his love of old school skateboard designs along with the colorful speed boats of the Miami Vice era. 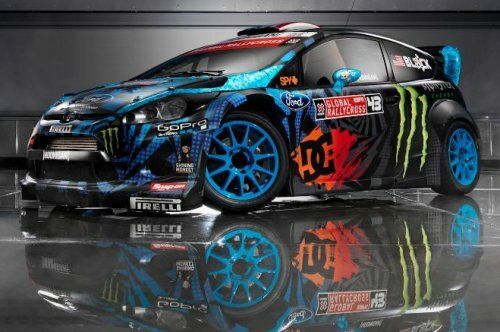 I cannot wait to see this new car soaring around the tracks of the Global RallyCross events and for 2013, Ken Block fans can expect to find all of the latest GRC news here on TorqueNews. Finally, Ken Block commented recently on the existence of plans for Gymkhana 6 – stating that he cannot say much but that the team is “taking a very different approach to it this year”. I bet that it will be awesome…no matter what direction they take.